Girl group T-ara received an award on a Chuseok Special TV program. Although it was a small award, they cried. People might have mistaken that they had won a huge award but there is a deeper meaning. T-ara chose to perform a cover of Im Chang Jung‘s comical song ‘Open The Door‘ on KBS2 Idol Song Contest, which was aired September 28th. They each wore old-fashioned training jumpsuits of different colors and made the audience laugh at their retro concept. T-ara is a girl group that has been around for almost 7 years since their debut in 2009. During the recording, they suppressed their stress by only thinking of their fans, the audience and viewers at home. They showed a different charm with their comical cover performance. The panel of judges recognized T-ara’s sincerity and gave them a special award called the Hangawi Award (Mid-Autumn/Harvesting Festival award). The award surprised the T-ara’s members and because it had been a such long time since they last won an award (in Korea), they felt more emotional. 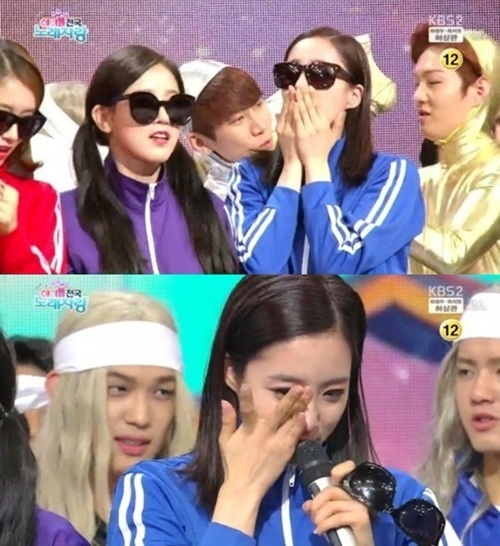 Eunjung said while welling up in tears, “we’ve been watching the original Idol Song Contest since we were young so we are very grateful and honored to have won this prize. We will be a T-ara that will always be filial to our parents.” The other members were also touched and their eyes reddened. There is no other group like T-ara, that has been through so many ups and downs. Every song they have released since debut has an addictive melody that captivates the hearts of fans. They have also clinched multiple first place awards at music shows with their retro-concept music, but because of “that incident” in 2012, T-ara have been constantly falling. Undoubtedly, they continued schedules and promotions after that incident. Not only did they promote in Korea, but China as well to constantly produce new music. Surely as singers, they have to depend on singing and music but they have been constantly ridiculed as “determination girl group.” Of course, the members have committed some mistakes, but the malicious comments directed at them have hurt them terribly. They were so scared to feel hurt during schedules that they would not read any comments on news articles. Although T-ara still has quite a lot of antis, T-ara’s sincerity in performing well on stage has made many people that used to have their backs towards T-ara, turn around and acknowledge them. Currently, news articles about T-ara’s appearance on Idol Song Contest have a lot lesser malicious comments. T-ara is finally receiving recognition after so long. Their tears carry deeper meanings that many people can never imagine. The only good thing is they are much more stronger in all-round after ‘ the rumors ‘. after all these years, with t-ara and queen’s, they are better and better, step by step climbing up again to pursue their dream. For bonus points, keep an eye on Gfriend when T-ara is declared the winner. Damn。。。。I don’t know about any of You Queens?! But, as a pretty non-emotional guy? As Eunjung❤️ said, getting an Award of any kind in Korea is very Special and Precious to be recognized at all!! It’s perhaps true in general meaning, but be assuring than they never falled out of my heart. All what they have done since are great songs, except really few ones. But remember that the kpop market has now too many good girls groups, so not to be able to overperform isn’t a terrible thing. Many great groups have few recognition. It’s a shame, but a major background helps a lot. They have been my ultimate kpop group since Bopeep Bopeep. They have been through so much and I am so very happy that they won an award in Kores.